How to Build a Shower That Won’t Leak | 41 Lumber - Serving Iron Mountain and the U.P. If you are renovating your bathroom or just installing a shower in a new one, one way to ensure that it won’t leak is to buy a manufactured shower enclosure. If you’re looking for something a little bit more unique, then you can install a shower pan of your own that works with your bathroom’s shape and design. 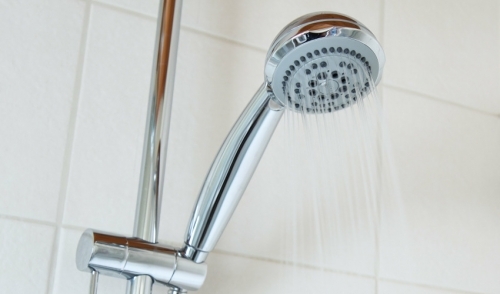 While dimensions may vary, there are some things that must be followed in order to ensure your new shower won’t leak. First, you must have a solid subfloor. Having this, the rest of the job will go a lot smoother. A common subfloor material used in shower installations is cement backer board. Next, you will need to have a clear idea of the tile that you’ll be using for your finished shower floor. Once you have done so and are able to determine the thickness of your tile floor, you can calculate the position and height of the shower drain. Rough-set the drain so that it will be flush with the finished floor. Additionally, you need to properly slope of the shower pan so that water runs towards the drain. Generally, one quarter inch per foot is recommended. The size of your shower pan will determine the amount of slope you’ll need. Once that is determined, use float strips around the perimeter of your shower pan at the appropriate height to accommodate your slope. Next, you’ll need to line the shower floor with roofing felt and wire lath, flattened. Hold in place with staples. For your mortar, use an acrylic additive to provide extra strength, since this will be a relatively thin layer. Mix the mortar and apply. Allow it to dry completely. Next, the install a waterproof membrane over the shower floor. This is a flexible material that can easily be cut with a utility knife. Be sure to allow 6 to 8 inches around the perimeter so it can be stapled on the surrounding studs. Carefully cut out the hole for the drain. Next, you are ready for your coat of mortar. Be sure to maintain your slope towards the drain. Once the mortar has dried, you can install the tile on the shower floor. Use a layer of thin-set on which to place the tiles. For grout, it’s recommended to use a polymer modified grout. This will help improve the grout’s water resistance and make it more flexible. While you’re at it, seek out a grout that provides antifungal resistance too. Once the tile is set and the grout has cured, seal the grout with grout sealer. Where the wall and floor meet, seal with a matching caulk. Over time, it will be necessary to re-seal the grout to ensure that your shower remains leak-proof.